City weekenders watching their wallets know to avoid London. Three days in Warsaw, Prague or Cracow can be had for £100, while three days in the UK capital could cost many times that amount. But it doesn’t have to. London can be seen – and enjoyed – on a budget, though you need to watch out for some pitfalls. For instance, some areas known for cheaper hotels (Earls Court, Bayswater and Victoria) will charge the same rate across the board, even though one hotel is on the verge of collapse while another offers free internet access and power shower. A little advice and some inside knowledge can make the difference between fidgeting between scratchy nylon sheets and sleeping soundly in a king-size bed. We’ve done the rounds, inspected a number of affordable London hotels and chosen our favourite five. The headline prices quoted are per person per night based on two sharing. Single supplements apply. 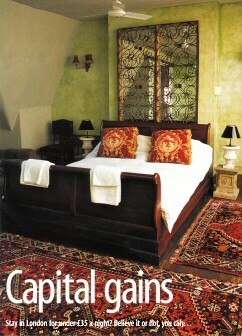 Owner Michael Star has converted two rooms in his beautiful Victorian home into incredibly stylish B&B accommodation. It’s the kind of thing you’d expect in a chic country-house hotel, but at a fraction of the price. The look could be called ‘faded grandeur’ – French antiques, worn velvet sofas, original fireplaces and well- trodden rugs have been hand-picked from antiques shops across Europe and placed in the two huge rooms, both with high ceilings. The first is on the ground floor (perfect for those who want to slip in and out of the house with ease); its bathroom is reached by a spiral staircase within the room and has a freestanding clawfoot bath. The other bedroom is on the top floor; a huge sleigh bed stands in the centre and there’s space for a third guest on a single bed that converts into a Moroccan-style daybed if not in use. Both rooms have televisions and a table where a breakfast of warm bread, juice and fresh coffee is served each morning. Addison Gardens is a five-minute walk from Shepherds Bush tube station. A two- night minimum stay applies.